Looks good! Everyone wants to sit in a sidecar, and that's good training for later in life too. 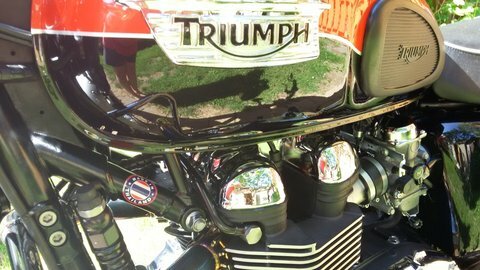 BTW... That Triumph parked next to you is made in Thailand so don't feel out of place. I did consider one prior to finding a Cozy sidecar at a give-away price, super low price changed my mind about the Ural. In retrospect the Ural would have been a better choice as I would have more power to run highway speeds. Grant the Ural's not much faster than a RE. On the Highway it can run 70 but there's nothing left. Where it does work better is on the back roads, stiffer chassis, better brakes (not much but any is good) and having reverse and in the case of my Patrol or the Gear Up 2 wheel drive. Shaft drive is better than a chain I think What you have to deal with in a non syncroness tran than had 4 speeds plus reverse. BUT you pay for all that I paid about $5000.00 more than for a new C-5 and Cozy. Plus the Ural is NOT the prettiest thing out there. I have about $8100 total invested which includes Pete's Cams, 19 tooth sprocket, PCV, AT200, and having the sidecar color matched, bought it new with great dealer discounts. As to speed mine cruises around 60-65 mph depending on wind and terrane, a strong head wind will slow it down some. Fuel economy is only 48-51 mpg, not bad for considering the sidecar decreased it from 70-77 mpg. Getting my 2012 C5 with Cozy almost back to original condition. She is running just fine. Added a milk crate and saddlebags with rain jacket and pants to the rack on the Cozy. Could not find an original Bar None MCC medallion so I had some stickers made up. Went to the local RE dealer's open house today but didn't get a bike wash but did get some photos.